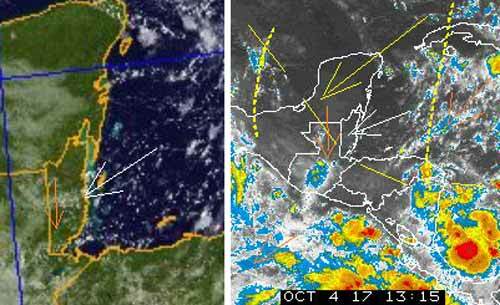 Belize NMS: Relatively warm, moist and somewhat unstable conditions prevail over the area. 24-hour forecast: Cloudy spells with a few showers and isolated thunderstorms mainly over the south and coast this morning, increasing over most areas this afternoon and tonight. General Outlook: Mostly cloudy skies with a few showers and thunderstorms over most areas Thursday and Thursday night. 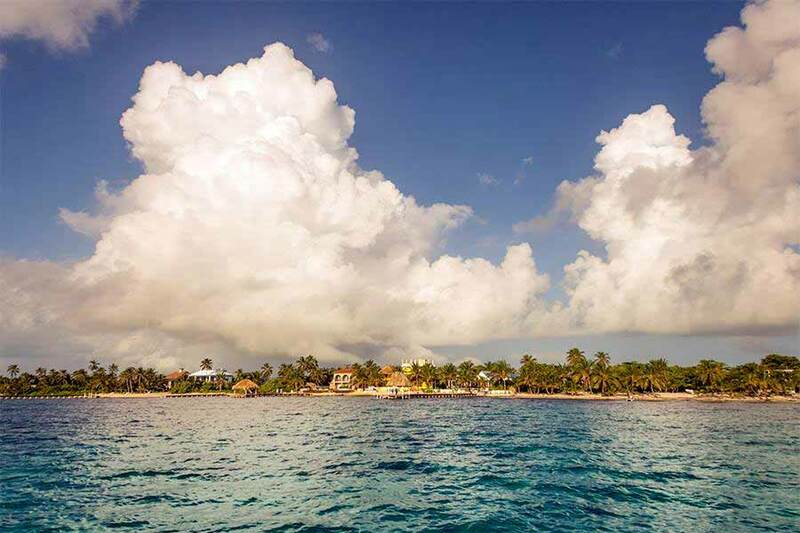 Today E-NE 5-15 kts Choppy-Moderate 3-5 ft A FEW SHOWERS AND ISOLATED THUNDERSTORMS. Tonight E 5-10 kts Light Chop-Choppy 2-3 ft A FEW SHOWERS AND THUNDERSTORMS. Tomorrow N-NE 5-10 kts Choppy 3-4 ft A FEW SHOWERS AND THUNDERSTORMS. Outlook NE 5-10 kts Choppy 3-4 ft A FEW SHOWERS AND THUNDERSTORMS. On Ambergris Caye this morning the breeze is from the ENE and the sea is flat calm. We have thunder showers passing sporadically. 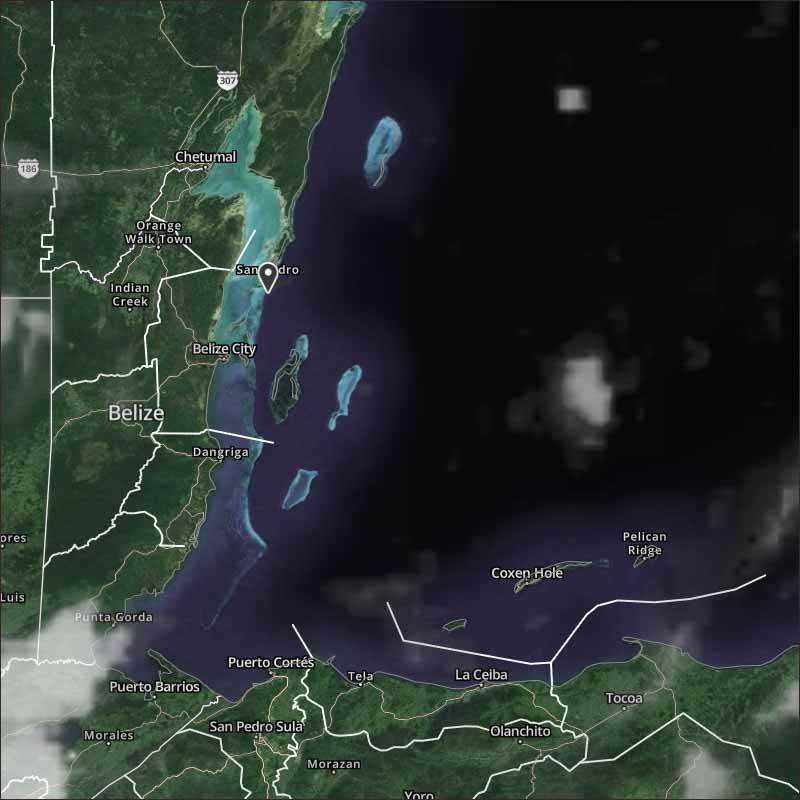 The expected high today is 87 f.
There has been a big change to our weather, there has been a bubble or large air movement of north Atlantic air, sweep over southern US and over night, that crossed over Belize and is going south of Belize. This is still resulting in Chunky Caribbean clouds coming in, but now from the NE, this has been causing the odd rain shower. There is only very slight high level northerly cloud. Presently, little or no rain. Looks like today will have a fair amount of sunshine, and patches of significant clouds, there could be patches of rain later.